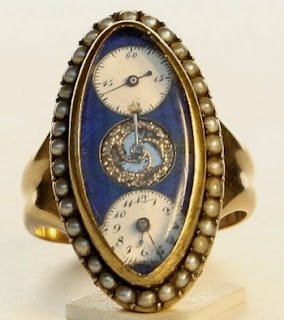 Rodama: a blog of 18th century & Revolutionary French trivia: Madame de Pompadour's ring-watch. "Twist this hook around the dial,"murmured an audacious courtier to Madame de Pompadour in 1752, "as you twist our empire 'round your finger!" This illustration of 1921, by Roy Rutherford Bailey, captures an otherwise undepicted moment in the life of the great Beaumarchais. 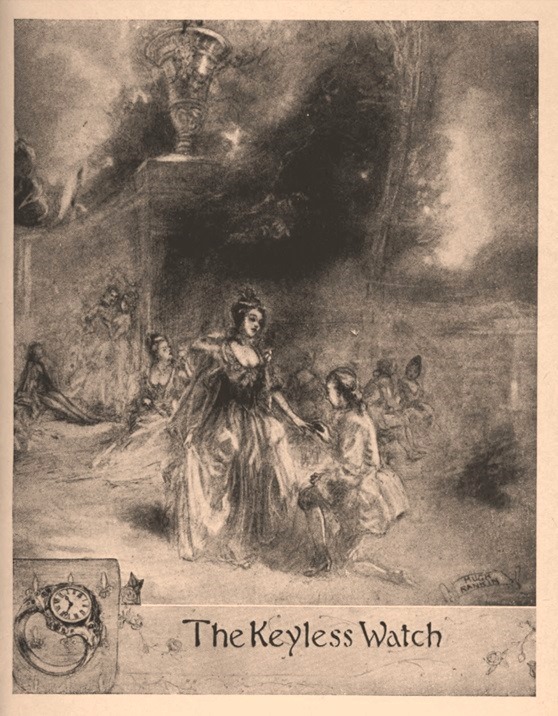 It is 1753, and the young Beaumarchais, a fledgling watchmaker, presents Madame de Pompadour with a tiny novelty "keyless" watch mounted on a ring. Beaumarchais himself described the watch: "It is in a ring, and is only four lines across and two-thirds of a line in height between the plates. To render this ring more commodious, I have contrived, instead of a key, a circle round the dial carrying a little projecting hook. By drawing this hook with the nail two-thirds round the dial, the watch is rewound and it goes for thirty hours". Louis XV was so taken with the ring that he ordered a similar model for himself. 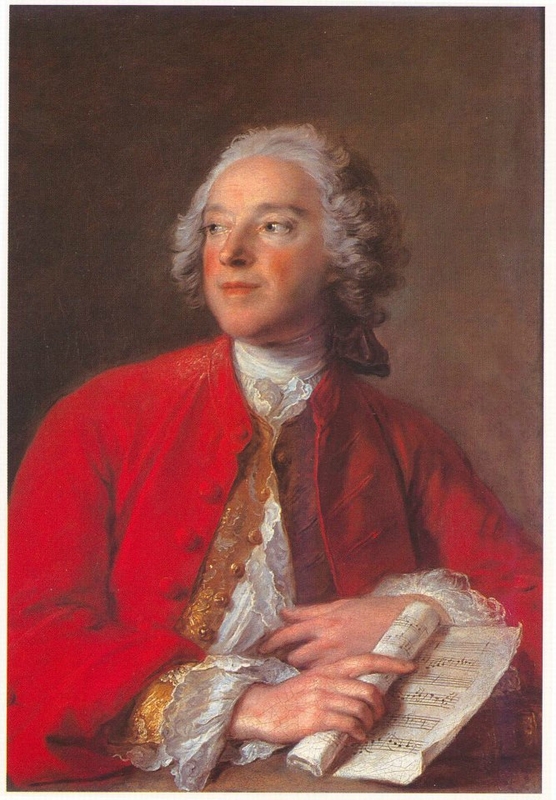 Beaumarchais's feat of miniaturisation was made possible by a new form of escapement. Spectacularly, the twenty-one year old challenged the respected royal horologist Le Paute for ownership of the invention, pursuing him through the pages of the Mercure and securing a humiliating judgment against him from the Academy of Sciences. The escapement in question is usually identified as the "double virgule"; even horological experts seem a bit unsure as to the details and it is not altogether clear (at least to me!) how original Beaumarchais's version really was. Apparently very few watches used the design, which was difficult to make. The Pompadour watch has long disappeared, though French "bagues-montres" can be found on the internet, mainly from the later 18th and early 19th centuries. The mysteries of Beaumarchais and the "double Virgule escapement" discussed by the experts - Horologie-Suisse forum.May 2012 and December 2013. Lapinbleu - animated watch escapements: the Virgule in action! “I have read, Monsieur, with the greatest astonishment, in your September number, that M. Lepaute, watchmaker to the Luxembourg, there announces as his invention, a new escapement for watches and clocks which he says he has the honor of presenting to the King and to the Academy. It is of too much importance to me in the interests of truth and of my reputation to permit him to claim this invention by remaining silent on the subject of a breach of faith. “It is true that on the 23rd of July last, in the joy of my discovery I had the weakness to confide this escapement to M. Lepaute, allowing him to make use of it in a clock which M. de Julienne had ordered of him, and whose interior he assured me would be examined by no one, because of the arrangement for winding of his own invention, and he alone had the key to the clock. “But how could I imagine that M. Lepaute would ever undertake to appropriate to himself this escapement which it will be seen I confided to him under the seal of secrecy? “I have no desire to take the public by surprise, and I have no intention to attempt to range it on my side by this simple statement of my case; but I earnestly beg that no more credence be extended to M. Lepaute than to me, until the Academy shall have decided who is the author of the new escapement. M. Lepaute evidently wishes to avoid all explanation, for he declares that his escapement resembles mine in no way; but from the announcement which he makes, I judge that it is entirely conformable to it in principle. “Should the commissioners which the Academy names discover a difference it will be found to proceed merely from some fault in his construction, which will help to expose the plagiarism. “I will not here give any of my proofs; our commissioners must receive them in their first form; therefore whatever M. Lepaute may say or write against me, I shall maintain a profound silence, until the Academy is informed and has decided. “The judicious public will be so good as to wait until then; I hope this favor from their equity, and from the protection which they have always given the arts. I dare flatter myself, Monsieur, that you will be kind enough to insert this letter in your next issue. "Instructed by my father since the age of thirteen in the art of watchmaking, and animated by his example and counsels to occupy myself seriously with the perfecting of the art, it will not be thought surprising that from my nineteenth year, I have endeavored to distinguish myself therein, and to merit the public esteem. Escapements were the first object of my reflections. To diminish their defects, simplify and perfect them, became the spur which excited my ambition.... But what sorrow for me if M. Lepaute succeeds in taking from me the honor of a discovery which the Academy would have 52crowned! I do not speak of the calumnies which M. Lepaute has written and circulated against my father and me, they show a desperate cause and cover their author with confusion. It is sufficient for the present that your judgment, Gentlemen, assures to me the honor which my adversary wishes to take from me, but which I hope to receive from your equity and from your insight." The following February, two commissioners were appointed to investigate the matter. In the registry of the Royal Academy of Sciences, under the date of February 23rd, 1754, a lengthy report is given, a short extract from which will suffice to show the results of the investigation. I have at last delivered the watch to the King by whom I had the happiness to be recognized at once, and who remembered my name. His Majesty ordered me to show the watch to all the noblemen at the levée and never was artist received with so much kindness. His Majesty wished to enter into the minutest details of my invention. The watch in a ring for Madame de Pompadour is only four lines in diameter; it was very much admired although it is not entirely finished. The King asked me to make a repeater for him in the same style. All the noblemen present followed the example of the king and each wishes to be served first. I have also made a curious little clock for Madame Victoire in the style of my watches; the King wished to make her a present of it. It has two dials, and to whatever side one turns, the hours always can be seen. 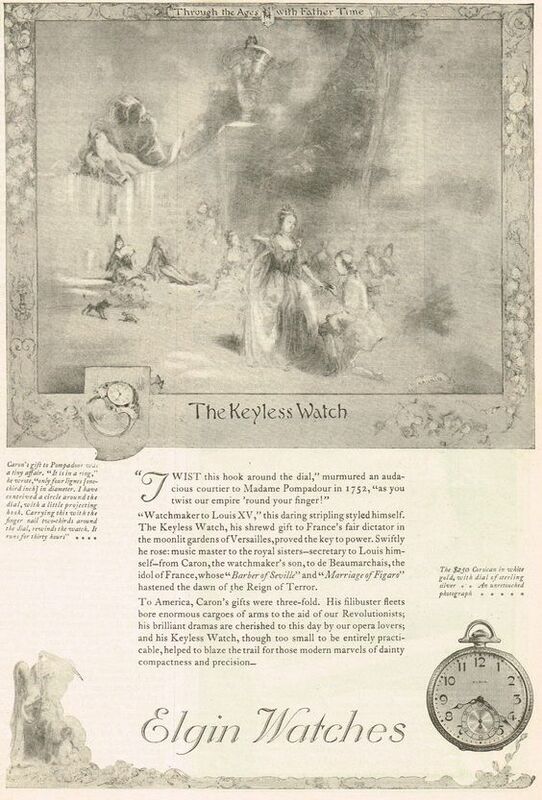 This lawsuit from which the young watchmaker issued triumphant, proved for him a valuable piece of advertising, for it gained him the attention of the king himself who happened to have a passion for novel devices in time-pieces. It was not long before the young Caron received an order from His Majesty to make for him a watch having the new escapement. [After giving numerous technical details the young watchmaker terminates thus] “By this means I make watches as thin as may be desired, thinner even than have before been made, without in the least diminishing their good quality. The first of these simplified watches is in the hands of the king. His Majesty has carried it for a year and is well satisfied. If these facts reply to the first objection, others reply equally to the second. I had the honor to present to Madame de Pompadour a short time ago a watch in a ring, which is only four lines and a half in diameter and a line less a third in thickness between the plates. To render this 55ring more convenient I contrived in place of a key a circle which surrounds the dial plate bearing a tiny projecting hook. By drawing this hook with the finger nail about two-thirds of the circuit of the dial the watch is wound up and goes thirty hours. Before taking it to her I watched this ring follow exactly for five days the second hand of my chronometer; thus in making use of my escapement and my construction, excellent watches can be made as thin and as small as may be desired. Caron, fils, horloger du roi.